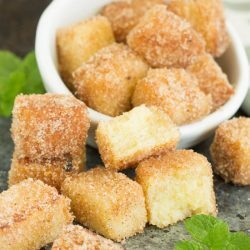 Pound Cake Churro Cubes are simple, bite-sized dessert treats that are fun to make and delicious to eat! I make a lot of pound cake recipes and sometimes we don’t get one eaten before it gets a little dry. Besides a dessert sandwich, I was trying to think of a good way to breathe new life into day-old pound cake. If you love cinnamon and you love pound cake, there’s a, um, dare I say 100% chance you’ll like these Pound Cake Churro Cubes. 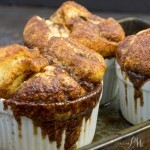 Pound cake chunks are lightly toasted in butter then rolled in a cinnamon and sugar mixture. Coating them in deliciousness much like traditional churros. Churros are a long strip of dough that’s deep fried then rolled in cinnamon and sugar. They are much like a doughnut but straight instead of round. Cinnamon is one of my favorite spices to use. Cinnamon is a warm, earthy spice that pairs nicely with apples and pumpkins. It’s the quintessential spice to use during the fall. When you just need a bite of something sweet or your entertaining where savory food is the main attraction, Pound Cake Churro Cubes are the perfect treat! 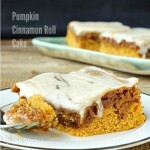 As well, during the fall, you may want to substitute pumpkin spice for the cinnamon. Apple pie spice would also be tasty. 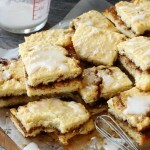 Additionally, A Cream Cheese Glaze or Caramel Sauce would be awesome drizzled on top. A raspberry sauce or simple Nutella would also be good. 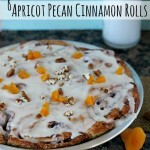 This is an easy recipe to get kids involved in the kitchen! 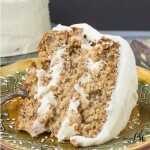 1 pound of cake with serve many people at 1-2 pieces per person. In a large zip-top bag mix sugar and cinnamon. I like these churro cubes, where can I find pound cake? I want to try this recipe, too. Thanks for sharing?